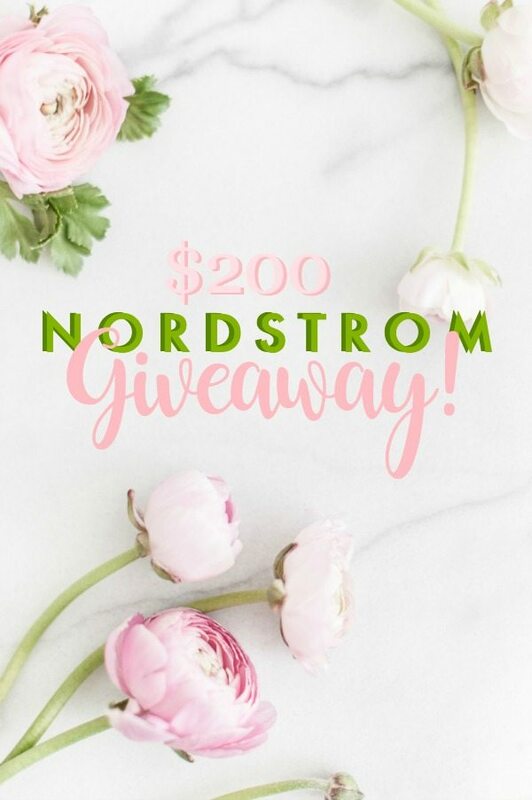 As a big ‘ole virtual hug to you, I’m GIVING away a $200 gift card to Nordstrom! I created a quick poll to see what kind of content you are enjoying most here, so I’d really appreciate it if you took a second to answer! I think the answers will be insightful and fun to read! Feel free to leave me a comment with what you want to see more of too and I’ll add it to my ever-growing list of blog post ideas! The winner of the giveaway will be announced next week, so good luck! Maybe you can treat yourself to one of the things in my V-Day Wish List or February Loves! I love fashion and beauty posts but also healthy food and lifestyle posts as well. This is one of my very favorite blogs. Thanks so much! I just recently subscribed to your blog because of your recipes I had seen somewhere else. Then I discovered you have fitness ideas (I’m a fitness instructor), fashion, decorating … everything! Thank you for writing this blog! Love anything related to hone decor – would love to see more of that. I love the beauty posts and when you share some of your favorite things. It’s always good to see new ideas! Also you shared some links to easy weeknight meals and that was very helpful for this mama! I made the slow cooker beef and broccoli last night and even the kids ate it. Still shocked! Happy Valentine’s Day Megan! I’d be happy to watch your two cuties if I lived closer. Have a good day and hoping you can kick your cold quickly. Hi Megan! I love all of your posts but especially the hair/skin care/makeup posts. Another topic I would enjoy more of: kids and family. Clothing ideas, toy/gift recommendations, fun family ideas, etc. I hope your cold passes quickly! I hate that I had to choose just one category – everything you post is fabulous, seriously. I love fashion and beauty but your food and fitness are awesome too! And then home decor, oh I could go on and on! Hi Megan – I enjoy your blog so much – thank-you! My favorite posts are home décor, so excited so see the progress on your master bedroom – love your choices! I also enjoy the healthy food and lifestyle posts – really just enjoy the entire blog. Feel better. For some reason, I could not choose a category to enter! Kept getting the “aw shucks we didn’t get your entry” message but I like the fashion posts. Feel better soon. I really love your fashion posts! I love your fashion and beauty tips but also fitness and home decor as well. I guess I love it all!!!! I love most all of your posts, but my favorite are fashion (I hate shopping, so clicking a link and Nordstrom’s free return policy is awesome!) and beauty (finally got around to following your hair curling tutorial yesterday; even purchased some of the products also) and anything healthy living related. Thanks for being my go-to morning read! I wish there was an “All of the above” option because I love everything you post! I always enjoy your outfits! Your veggie lasagna recipe rocks, also. I look forward to opening your emails each morning. I loved when you asked your reader questions and posted the top answers…how to sleep well….exercise…. I am using the lavender scent before bed! Happy Valentine’s Day!! I really enjoy your fashion posts. Gift recommendations are right up there too. Looking forward to your bedroom make-over. I picked the fashion posts as my favorite, but I also like the fitness/food posts equally!! Feel better, Megan! I have been loving your motivational and productivity type of tips lately but I really love your beauty, food and home decor posts, too. I check your blog and instagram every day and just appreciate you so much. I look forward to reading your blog posts each week! I really enjoy seeing your lifestyle and exercise posts. I like your suggestions and see which ones I can incorporate in my life-still working on getting up early to workout! I honestly love it all! Fashion, fitness & food, home decor….. Such a fun blog to read! Thank you!! Megan, you’re the absolute sweetest and i truly love all of your posts. It’s hard to pick a favorite but i really enjoy your fashion and beauty tips. P. S. I so enjoy Your IG stories with your precious kiddos! It was a tough poll.. I love all of your content.. It was soooo hard to choose. I really love all the topics! I really enjoy reading your blog including healthy recipes, fashion and home decor. Hi, Megan! I love your fitness posts the most. We are both busy moms with young kids and I feel like we can really relate to each other. I love staying fit and healthy but a busy life makes it SO hard sometimes. You give me some great ideas and great inspiration. Keep it coming girlfriend. You are my favorite blog. As a fellow shorty, you help me with trying on clothes so I don’t have to! Love your “favorites” and gift ideas! It was hard to choose just one because I love all of it! Hi Megan! I love all your posts but the fashion is my favorite! I have bought sooooo many things because you recommended them! Happy Valentine’s Day! Wow! Hard to pick just one category that I love about your blog. I’ve tried many of your suggestions from fashion to fitness to home decor ideas to fitness and health and I just purchased hair product based on your usage. I trust you and appreciate your honesty and that’s why I’ve been willing to try things based on what you’ve written. You’ve been a blessing to me and to many others! I like the outfits and the food and fitness posts. Happy Valentines Day!! Would love to see another style me post like Ali-shaun. I love your home decor, healthy lifestyle, and organization posts! Would love to read more about active wear!! Happy Valentine’s Day Megan!!! I lately started following you. And it’s amazing to have you part of my daily schedule virtually. I look forward to checking your insta stories. Love your clothes review and your choice of clothes are really graceful. Also I check your home decor ideas(specially seasonal and festival decor). I know it must be taking a lot of your sweet time from your kids and thank you for that. Have a great day!! More DIY please! Your ideas are inspirational and creative! I agree that it was too hard to pick just one… fashion/beauty (of course!) but home, fitness, diet, organization.. I love it all! I agree with everyone else; all of your posts are pretty great! I like the variety and the effort you put in to your blog. It’s pretty obvious you have a good work ethic and you take pride in what you do. Thank you for all of your efforts! I truly love all of your posts, but your entertaining ideas are really among my favorites! Happy Valentine’s Day to you and your sweet family! We always spend Valentine’s Day at home. I fix a special candlelit dinner (sea scallops tonight!) and then we watch a movie. Sometimes I buy a new tablecloth or dishes or goblets! It’s so crowded and crazy at the restaurants so this works out much better. When our kids were small we had a special dinner for them and they got to eat it in their rooms while playing games or watching a movie. That gave us a chance to make it special for them too and allowed us to have a quiet dinner! I honestly love ALL of your content, but I’d love to see more organization/productivity posts. I enjoy getting inspiration from others when it comes to that area of my life. I’m really liking all your content lately, such a good mix. So many have just gone to fashion, and who can afford new clothes all the time? Especially us at home Moms, who don’t need work clothes. When you do fashion, I do like that we are the same height! You are a tiny girl though, I’m about 15# more than you. Still helps with tops especially, sleeve length etc. Keep up the well rounded posts! I wanted to pick two…I put Food & Fitness, but I also am intrigued with your Daily Affirmations info you’ve just started talking about. I think I’m going to get the book you’re reading. I love watching your children grow up and your fashion updates. It is very hard to pick just one category because I honestly do enjoy every post ! Make up and hair tutorials are great and also love your health and wellness ideas . But really, I enjoy everything you post….great blog – thank you !! While a lot of blogs focus on fashion, I like that you cover all topics: fashion, personal growth, cooking, home decor and fitness. Honestly, I would just keep doing what you are doing. It works! I have unsubscribed from a few blogs because they seem to get a bit repetitive with the same outfits etc. You do a great job of keeping your blog fresh and interesting to read. Fashion, beauty, healthy living and family posts! I love your “In the dressing room” and “Outfits Lately” posts! I like the variety you share in your posts. But the fashion is my favorite. I find shopping overwhelming at times so your fashion post inspire me and keeps me focused on my purchases. I really do enjoy all your posts, but I can honestly say I never shopped on Nordstrom until after seeing your posts on Pinterest! Happy Valentine’s Day! Hi Megan! Your blog is a favorite of mine! I think fashion and beauty are my favs, but I also like fitness and gift ideas 🙂 Thanks so much! Happy Valentines Day Megan!! Hoping the cold doesn’t last to long for you!! I always love your fashion and beauty posts, but I am truly loving your productivity and organizing posts this year! On the poll I put that I enjoy beauty and fashion the most on your blog, but it really is a toss up between that and food & fitness. I just love your blog and I have been following you on Instagram for quite some time now. Love your blog and have been a longtime reader. Your workout routines are an inspiration but I love the recipes you recommend. I tried the beef and broccoli recipe the other day and it was fab! Love following for your fashion and beauty. I also am 5 ft tall and 90 lbs so it is so helpful to see fashion that is geared for petite sizes. Your home décor is also extremely gorgeous. Love everything about your blog actually!!!! I would like to see more of your favorite things as you are always up to date on whats new. Looking forward to see the progress of your bedroom! What draws me to your blog is your continued commitment to a happy and healthy life. Love your fitness tips, aspirational posts mingled in with home and fashion. Love that you keep it real. Like most of the others, I have a hard time naming just one thing. I love the Beauty and Fashion but the home decor and food posts are a close second. And I enjoy watching your stories, especially with the kids in them. so cute! I love the home decor posts, beauty products, and exercise/fitness posts. Your blog is one of my favs. The content speaks to my everyday life and I also love the fun and fresh imagery when I’m viewing the information. I like how you “break out” of the norm and bring some new and interesting wellness content to your blog, it’s a nice way to refocus and look inward on ourselves. Thanks for your hard work! I enjoy your healthy lifestyle posts. I like the information on meals and meal prep, the fitness posts, and the sleep posts. I also enjoy your productivity posts and started using the Get Focused app based on your recommendation! You are a great writer and come up with fresh interesting content! I love all your home decor posts the most and would love to see more! Happy Valentines Day!! Hope your cold goes away. What a great give away! Love your home decor post and beauty. Would looooove to win the gift card as I have a dress to buy for my son’s wedding in June!!! I love the organization and household/family managing posts! If I could only click on all of the choices! I went ahead and chose Fashion/Beauty because I thoroughly enjoy them and click and shop from them all the time! And, you have the same body type as my 24-yr-old daughter so it makes it super easy to shop for her! But, honestly I love ALL of your posts! Megan – there was no “all of the above”. I look forward to everything you post. You speak to me on so many levels, and you’ve become a friend to me, even though you don’t know who I am. I’ve been following you for a few years, and this is the first I’ve commented. Adore your family…you set such an example as I have 2 lils of my own, a wonderful hubby that works hard and is such a great dad. I just appreciate all that you are and all the positive vibes that come thru in your posts, pictures and thoughts. Keep it up girl. Its important to surround yourself with those that bring you joy, lift you up and make you smile and ensure those people are recognized and told. Its likely a challenge to log all that you do, have a camera in your face all the time, and expose parts of yourself you never thought possible. You are inspiring my dear. Please continue it all. You have impeccable taste. Hi Kelli! Thank you so much for such a sweet comment! I really appreciate you taking the time to be here! I know how busy life can be with two little ones! Beauty and fashion for sure, with the dressing room posts. I like your fitness and food posts most since that’s how I found your blog, but I also enjoy the fashion posts. I get overwhelmed with shopping (in-store and online) and I love to use your posts as a much smaller, curated collection from which to shop. Love your fitness and nutrition/food posts. I love fashion and beauty posts. Thank you for finding petite options for us shorties!! It was hard to pick just one. Your blog is one of my very favorites. Your fashion is great, but I also really like your home style/ideas plus your thoughts/tips/tricks around life in general. Please keep it coming! I love all of your content and was hard-pressed to pick just one! Keep up the good work mama! Love you! I happened upon your blog back when you painted the stripes in your foyer. I’m into interior design. But I soon became obsessed with your fashion posts! Now I look forward to each and every one! Thank you so much for sharing, Megan! As a fellow petite-but-athletic gal I’ve got to say I appreciate your fashion posts the most. It’s great to get ideas from you and to see how you style pieces for a smaller frame. BUT, second place definitely goes to your meal posts! My family went nuts for the beef and broccoli (yippeeee!) and I got inspired by your meal prep and planning posts. Thank you thank you! I always look forward to reading your blog. What a fabulous giveaway! Love all of your posts, but I would love to see you bring back some more home decor. Love your fitness and food posts. So inspirational! I love the variety. I chose food and fitness, but honestly I enjoy all your content! I love the fashion stuff best! Your blog is so fun! I love all your posts, but your fitness and productivity posts are my personal faves. I’ve been reading your blog for a few years and really enjoy your positive energy, fashion advice and fitness tips! Keep it up! love your wardrobe posts, especially around Nordstrom sales! Absolutely love your fitness and fashion posts! I’ve especially enjoyed going back to your post-partum fitness posts – super inspiring as I’m (still!) trying to shed my extra pregnancy pounds. I love it all! My faves are home decor/organization. Baby/toddler life. Fitness. Food. I love fashion on the blog but i would love to also see some work-appropriate items every now and then! I love your style! Also love seeing your dinner ideas! Thank you so much for that! JOY is contagious! I love reading your posts on fashion and everyday life. I also loved the hair tutorial and even bought the curling iron you linked. Looking foward to the bedroom makeover, can’t wait! Thanks for all the inspiration and great ideas! I enjoy your blog even though we’re miles apart size wise . ( 1X for me ) I’m also in my mid seventies, but you keep stylish! I enjoy the health side of your blog -just ordered the “gummies” for sleep. Keep up the good work ! Thank you SO much Eloise for taking the time to write! I love that you enjoy by blog! Your comment really made my day! Hope you have a great one!